Phi Beta Kappa Dinner at Tempe's Cafe Boa, hosting Washington D.C.'s John Churchill, Anne Tria Wise, Ronnie R., Rhiana Quick along with Kate Soule of Dartmouth, Kate Lehman of ASU, Dr. Neal Lester and his wife of ASU and President Ann-Marie Anderson, Esq. President Ann-Marie Anderson, Esq. welcoming PBK National Secretary andRhodes Scholar John Churchill from Washington, DC, to ASU's Art Museum in conjunction with the "Key of Excellence Award" presentation and monetary prize, February 2014. Phi Beta Kappa members from Phoenix, Washington, DC and New Hampshire meet in the historical Arizona Biltmore's Mystery Room for the "Lead the Way" Forum to discuss support of Phi Beta Kappa's National Arts & Sciences Initiative, February 14, 2014. 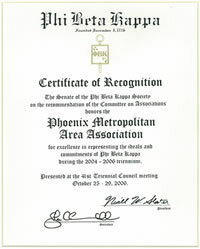 The Society awarded three certificates of recognition, one to mega-association, one to mid-size, and one to small association (us). The Society has a meeting once every three years, so the award was quite an honor. We also received $1000 which promptly went into the scholarship fund.